When I began my blog, I didn’t have any specific goals in mind. Okay, maybe I hoped the end result would be a million followers and a six-figure book deal. But really, I started because I am a writer and I have words, thoughts, and ideas banging around in my head all the time, begging me to lead them in a dance on the page (or computer screen). So, I write, not knowing who will read, whether or not they will enjoy it, hate it, be bored by it, or just ignore it. Then something comes along, like this award, and I learn that someone is not just reading, but liking my blog! 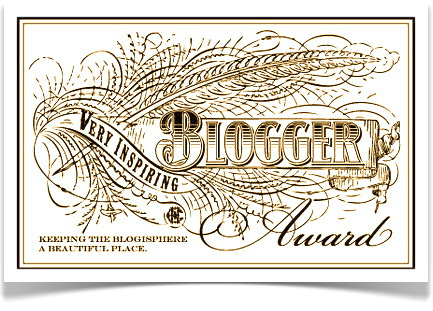 The lovely Anna at I’m Not Lost, I’m Just Exploring, was kind enough to nominate me for the Very Inspiring Blogger Award! Thank you, Anna, for making my day. 1. I have an uncanny ability to memorize song lyrics. And my singing voice is pretty decent, I’ve been told. 2. I’ve wanted to be a writer since I was 7. I still write fiction when I can find a bit of spare time. 3. The only time I’ve had long(ish) fingernails was for my wedding. Piano lessons for 8 years, then years of basketball, then I became a physical therapist – for me long fingernails are impractical and uncomfortable. 6. If I could only eat one thing for the rest of my life, I’d be cool with tacos. 7. I like making scrapbooks. Go check them out, spread the blog love! This entry was posted in Award and tagged Award, Blogging, Happy, Very Inspiring Blogger Award, Writing by A French American Life. Bookmark the permalink. Thank you so much :)! I love your blog! Your blog is insightful and smart! Congratulations! Thank you so much! I just love your blog, so this means a lot to have been nominated by you! Absolutely! Thank you for your fabulous blog! Thanks so much–I am quite flattered! I look forward to reading through your archives (and the blogs recommended in this post and in your sidebar). Absolutely! You have a great blog!